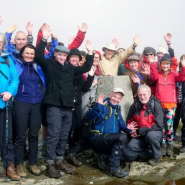 On 1st April 2017, the HF club climbed Ben Lomond via the tourist path. What’s unusual about that? 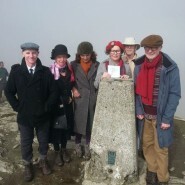 Well, we dressed up in 1920’s clothing to re-enact the event of the Ben Lomond Mountain View Indicator being installed on a stone plinth, on the summit by HF members in 1929.This event was funded by The Daily Record through its readers and installed by the HF members. Unfortunately, the mountain view indicator is no longer on the summit of Ben Lomond due to wear and tear. The original negative template of the mountain view indicator is with the National Trust for safekeeping and is looking at it being installed on the summit in the future. In “The Great Outdoors Magazine”, March 2017, the Glasgow HF Club mountain view indicator story was mentioned. The original 1929 idea was enthusiastically taken up by the Glasgow HF Club of installing the plinth and mountain view indicator on the summit of Ben Lomond on 1st April 1929. The story continues with another try to set up a stronger memorial of an etched metal plate protected by glass, set up in 1933.This too gradually became worn, and in 1960 the engraved plate was stolen. The date might be symbolic in view of what happened and what was to follow. The idea came to me for a centenary event, by reading the archives of the HF club in the Mitchell Library under TD 1937, 5th Floor, archives. 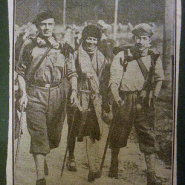 One of the black and white photographs, of the summit of Ben Lomond on 1st April 1929, gives an insight into HF members and what they were wearing on the day. 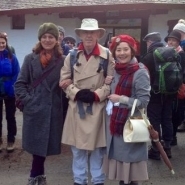 Most of the members from the club looked like they were going to the office, instead of going hill-walking, raincoats, hats, scarves, walking shoes and no rucksacks, just handbags. 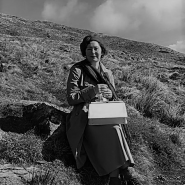 It was rumoured that you were a little weird, if you went hillwalking, so to keep it normal and secret just wear office clothes and sandwiches in pockets. Umbrellas were a form of walking pole back in the 1920’s. What would it be like to wear office wear and carry no rucksack but just a handbag to put your food and drink into? Nine HF members dressed up for the challenge, and fourteen members participated with us to celebrate this momentous occasion, a piece of history to be treasured and not forgotten. It was not very comfortable to wear a skirt, raincoat and hand bag as I was very conscious of tripping on my long skirt and raincoats are only showerproof and not breathable and my handbag can carry only a small water bottle, a sandwich, which became squashed. What did I learn from this experience? Our present HF members and the old ones in the black and white photograph like to try new experiences and that there is a great comradery within the club that will never die. I have great respect and admiration and a little bit envious of the HF members in 1929, they showed that an idea of building a plinth and installing a mountain view indicator can be supported by HF members, with great determination no matter how hard, along with many setbacks to reach their goal. In 1929, the HF members were brave, even pioneers, no problem too big or too small to solve and so we are left to consider what can we do to follow in their footsteps.